Free XWIS test-drive coming to a city near You! Just as WebIntelligence makes it easy to manage multi-dimensional data with its micro-cube, so XWIS brings similar in-dashboard OLAP capabilities to Xcelsius development. This reduces dashboard complexity by avoiding the need to create multiple connections to the server for different slices of data and by eliminating the formulas required to knit these slices of data together in the spreadsheet. Less complexity means you’ll achieve a significant increase in design productivity (meaning more dashboards, developed more quickly) and at the same time you’ll see a dramatic improvement in dashboard performance (both initial load and click-to-click). XWIS also enables the out-of-the-box addition of key end-user functionality such as drill-down, drill-across and “slice and dice”. And to top it off, all this is available both off-line and on tablet devices. But, I want you to see this for yourself … so, I’d encourage you to get along to one of the hands-on XWIS test-drives that Antivia is planning, this fall. By taking a test-drive, you will see all of these capabilities in action as you build your own interactive, connected dashboard, from scratch, against a significant dataset, within minutes, using XWIS. Antivia is running test-drives in Chicago, Dallas, Philadelphia and New York during the first week of October. My good friend Donald MacCormick (a key-player in the acquisition of Xcelsius by Business Objects and one of the guest speakers I hand-picked for my BI Dashboard Formula) is hosting each test-drive. Given the interactive nature of these events, space is limited, so I would urge you to register for an XWIS test-drive today. 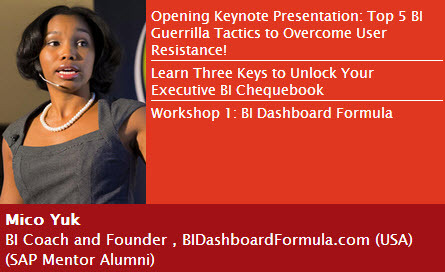 Mico Yuk is a SAP Mentor and BI Influencer, co-founder of Benchmarkers Business Intelligence and founder of the Xcelsius Gurus Network, the Everything Xcelsius blog. To learn more about her, please visit her about page. For weeks there has been announcements all over Twitter that the Xcelsius 2008 Service Pack 5 (SP5) with support for Windows 7 and Office 2010 (32-bit) was available on the Service Marketplace. Today we were notified that SAP has made it generally available on its new product updates site: http://bit.ly/xgnFt1 (see the official announcement from Matt Lloyd). This Service Pack is a cumulative patch, so it incorporates all the patches to-date and delivers new fixes and features. All files must be extracted and downloaded from the zip file and ran directly from your hard drive. After Service Pack 5 (SP5) is installed, the version number in the about box will change to: 5.5.0.0. Wrap Text Support for Scorecards: In scorecard components, text can be set to wrap within cells. 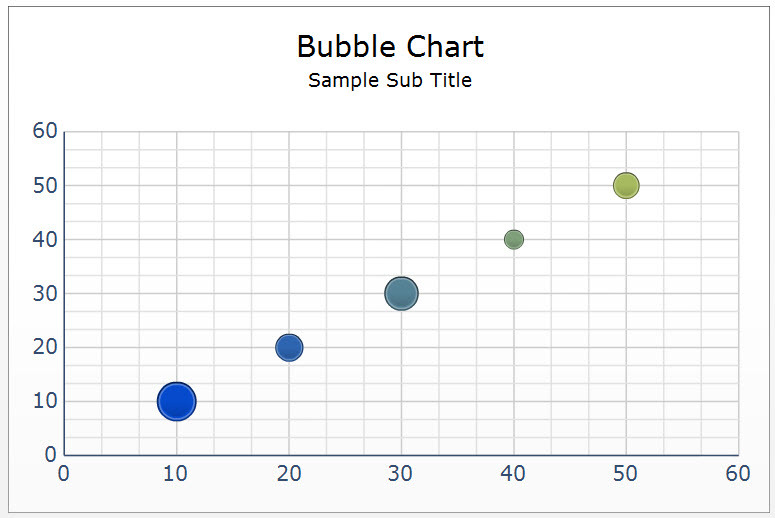 Enhanced Support for Bubble Charts: Now you can now bind the alert values in a bubble chart so you can have one series but have control over the bubble colors using alerts (before you had to define one series for each color which was a pain). Below is a screenshot of the Bubble Chart. Soo Tang Yuk (@sootangyuk) is the ‘Xcelsius Gurus Network” community manager and evangelist. To find out more about her, please visit the About Us page. NEWS ALERT! Xcelsius 2008 Service Pack 4 (SP4) is now available to everyone! Last week on Twitter we saw an annoucment that Xcelsius 2008 Service Pack 4 (SP4) with support for Windows 7 and Office 2010 (32-bit) was available from the Service Marketplace. Today we were notified that SAP has officially announced its availability on the general download site (see the official announcement from Matt Lloyd). This Service Pack is a cumulative patch, so it incorporates all the patches to-date and delivers new fixes and features. All files must be extracted and downloaded from the zip file and ran directly from your hard drive. After Service Pack 4 (SP4) is installed, the version number in the about box will change to: 5.4.0.0. Soo Tang Yuk is the ‘Xcelsius Gurus Network” community manager and evangelist. To find out more about her, please visit the About Us page. NEWS ALERT! Xcelsius 2008 Fix Pack 3.5 (FP3.5) his now available! We are happy to announce the release of Xcelsius 2008 Fix Pack 3.5 (FP3.5). The Fix Pack must be applied to Xcelsius 2008 SP3 (version: 5.3.0.0) or any of the previous fix packs. If you don’t already have it installed, please click here. The Xcelsius Enterprise 2008 Fix Pack 3.5 patch is both for Xcelsius 2008 SP3 Engage and Enterprise. If any of you decide to download FP3.5 this weekend, please let us know! We look forward to your feedback! Being the first to deliver all news, we heard recently that having left SAP BusinessObjects 2 years ago, Donald MacCormick, the former CTO of BusinessObjects who played an instrumental role in the acquisition of Xcelsius by BusienssObjects in 2003, is heading back to the world of BI to become the Chief Product and Marketing Officer at Antivia. Known for his ‘tell it like it is approach’ we manage to catch up with him to ask a few questions about his new role and outlook on BI! This is a great read, enjoy. Q: For those who don’t know you, why don’t you tell us about your history with Xcelsius and BusinessObjects? Donald: Back in October 2003, Roger Sanborn, one of the key product managers at Crystal, sent me an email suggesting I go to the site, www.infommersion.com. Infommersion were the creators of Xcelsius and as soon as I saw it, I was captivated by the concept. This was a couple of months before the acquisition of Crystal by BusinessObjects closed, which was fortunate timing as BusinessObjects was a much more acquisitive company than Crystal. I spend the next few months demoing Xcelsius to anyone in the organization who would listen,to the point where I think that some people thought I was on some sort of commission from the folks at Infommersion, but finally, about 18 months later, after a lot of hard work (mainly by Tom Schroeder and Mike Brooks), Xcelsius and the Infommersion team became part of BusinessObjects, and the fun really started. Q: What exactly brought you back to Business Intelligence? Donald: I left SAP BusinessObjects and the BI world two years ago for a fantastic opportunity to work at a mobile banking startup in California, but personal commitments meant I had to return to the UK and, as a result, I had to find something new. Having spent the previous 20 years in the BI community it was always likely that I would return to it sooner or later. I find the BI world fascinating, the use of information is universally acknowledged as a key activity for organizations, but it is hard to find organizations who do it really well. As a result, there is huge potential for both business impact and technical innovation which is an exciting combination. Additionally, BI is a market where there is hype and substance in almost equal measure, which makes the whole process of marketing BI tools an interesting one. So, when the opportunity arose to get involved in both product and marketing with a BI startup, it was not that hard a decision. Q: Why did you choose to join Antivia in particular? Donald: The genesis of Antivia’s XWIS product was at a meeting I had with Mark, Paul and Jason (three of the Antivia founders), where I was talking about an issue which had just caused the loss of an Xcelsius sale. They immediately said, “Give us a week, we think we could do something about that!” and sure enough a week later they gave me a demo of the first prototype of XWIS. Since then I have been involved with them as an advisor and board member, it has been amazing watching them take that initial pre-alpha of the product, flesh it out, sell it to their first customer and take it all the way through to the point now where many mainstream SAP customers around the world use XWIS to underpin their enterprise Xcelsius dashboards. Joining them full time felt like a natural next step. In addition, having worked for a California based start-up for the last two years, it feels like a nice balance to now be involved in the UK technology start-up world which is much more active than many people realize. Q: What does Antivia’s XWIS add-on for Xcelsius actually do? Donald: This is not really the forum for an advert, so if people want to find out I suggest they go to our website at www.antivia.com, but to give you a teaser Ryan Goodman from Centigon Solutions was kind enough to say recently, “I can vouch from personal experience that XWIS cuts [enterprise Xcelsius dashboard] development time by 10 to 20 times”! Q: Does that not make it competitive with SAP? Donald: Actually quite the contrary, XWIS is completely complimentary to the SAP product set, it helps SAP customers get more from their Xcelsius and BI Platform investments, it is a win for Antivia, SAP and our joint customers. As a platform, SAP BusinessObjects is always going to be at the heart of a strong ecosystem. Antivia is striving to be a key player in that ecosystem driving co-innovation with SAP products. We started with connectivity between Xcelsius and WebI, but have since expanded to off-line dashboard distribution and most recently, mobile dashboard delivery and have more co-innovations in the works for the rest of 2011 and beyond. Q: So what do you think about the recent “Xclesius” name change? Donald: Given the many strong opinions expressed on-line when they made the change it would have been hard not to notice, but knowing Xcelsius from before it was acquired by BusinessObjects I find it hard to call it anything else. I sympathize with the rationale for the change, but I am afraid that for me “Dashboard Designer” is a little too soulless for one of the more innovative software products of the last 10 years. Q: Going back to BI, you talked earlier about “BI hype and substance in equal measure”, what did you mean by that? Donald: The substance of BI is that it is universally accepted as a vital activity for organizations. After all, who doesn’t believe that there is value in better use of information? However, the art of BI is to tease this substance from the inevitable short term hype as new technologies emerge. A good example is the current buzz about “big-data”. Clearly there is an advantage to being able to analyze huge amounts of data and “big-data” sounds exciting, but we need to be careful, as with so many new BI technologies over the years, there is both hype and substance lurking. The hype of “big-data” is the idea that a few people in an organization can analyze large volumes of data and come up with magical, instantly transforming insights. The substance is that the results of deep analysis can be used to drive the right subsets of information into the hands of people right across the organization to help them be more efficient and effective in their everyday jobs. Q: So, having just left the world of mobile banking, how do you see mobility affecting BI? Donald: It is obvious that mobile will profoundly affect BI over the next few years, just as it will affect pretty much every other part of our lives. However, once again we need to be careful not to get carried away with the hype. To a large extent BI has been mobile for many years already, most of us travel with our laptops and so BI is already within easy reach. The question is what additional business value can BI offer if delivered on a tablet or a SmartPhone? Without answering this we risk spending a lot of time, money and energy mobilizing BI without getting a good return on that investment. Obviously the starting point will be to take existing BI content and mobilizing it, however, we need to find ways of making sure that this does not mean a redevelopment for every device, as that would be a lot of cost for little return (this is a key focus of the XWIS Anywhere product). Ultimately, there will be more to mobile BI than simply delivering content on the iPad, because it is easier to carry around than a laptop. Mobile offers a new real-time channel to end-users which can significantly amplify the benefits of BI, but only if we take the time to make sure that each user gets exactly the information they need to do their job, no more, no less. Q: So now that you are back what is the best way for folks to follow or keep up with you? 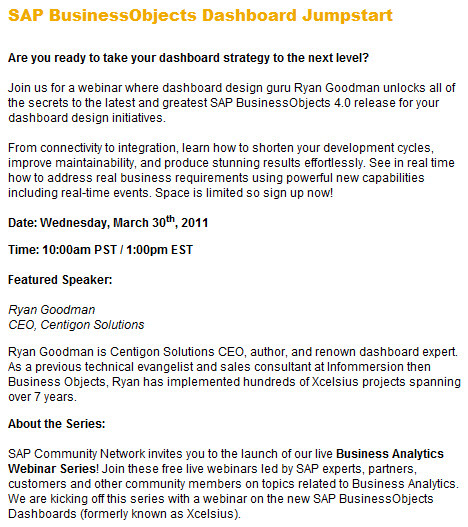 This week I am extremely excited to help introduce through SCN, the latest version of SAP BusinessObjects Dashboards 2011, on Wednesday, March 30, 2011, at 10:00 am PST, 1:00 pm EST. For our Xcelsius Gurus network members who have stayed on top of the BI4.0 launch, you may have already seen some of the features in previous webinars. With this webinar, I am going to take a slightly different approach to introduce Xcelsius based on my previous experiences using the tool and highlight its newest strengths. Following the webinar, I would love to congregate to gain your feedback. We’re doing it again in April! I’d like to formally announce open registration for our highly successful Xcelsius Advanced Developer Workshop (aka Training) that will take place in Miami, FL on April 19-20, 2011. Conducted by Mike Alexander (author, Crystal Xcelsius for Dummies) and myself, this 2-day event is jammed packed with content and always sold out within a few weeks of announcing. Last year (see pics below) the training sold out (we even had a waiting list, see how packed it was by viewing our album here! ), so we encourage everyone to Register before March 31st , to secure your seat and receive the early bird special SAVINGS OF $200. On the 1st day, the training will cover Basic Data Connectivity Techniques, including, Advanced Dashboarding Techniques. On the 2nd day, we will cover Advanced Data Connectivity Techniques and much more! We will be also be covering SAP Crystal Dashboard Design. To view the entire agenda go to http://xcelsiustraining.com. Follow us on Twitter or FaceBook for special announcements, as we will be giving away a free seat again this year. Don’t forget the early bird special ends on March 31st, so register today and save $200. We look forward to seeing everyone there!! Email us at gurus at everythingxcelsius.com with any questions. Mico Yuk is a 2010 SAP Mentor and the founder of the Xcelsius Guru Network, the Everything Xcelsius blog, and co-founder of Benchmarkers Business Intelligence. To learn more about her, please visit our About Us page. To say that 2010 was a very memorable year for the Xcelsius Gurus community is an understatement. To see what I mean, take a minute to read my 2010 Top 10 list below. Coming in at #10 is the SAP Teched conference in Las Vegas. There I had the pleasure of co-hosting the Xcelsius hands-on sessions with 2 of my favorite technical guys from the SAP Xcelsius and RIG team, Matt Lloyd and Patrice Lebhan. The event drew in such a crowd that we had to turn away attendees. I also had the pleasure of doing a live interview with fellow mentor Jamie Oswald (a must watch for those considering attending TechEd in 2011) and former SAP Executive Marge Breya. There aren’t enough lines to explain how great this event was so click on the links below to see firsthand. Click here to see pics of the event! Hosted by Mike Alexander and myself in Dallas, TX this was a jam packed fun event. This event is traditionally sold out with a waiting list, so if you are interested do write us an email early to get on the list. We are considering doing one on the West and East coast this year due to popular demand. If you visit our site often enough, and our Google statistics show that many of you do, you have probably noticed that a few months ago we made some small updates to the blog’s design. Two major updates include our sleeker image enriched front page now with enhanced social media buttons and our new ‘Resources’ tab which is a one stop shop for Xcelsius related links on the web. You will also notice that our ‘Showcase’ tab now takes you directly to our commercial website to see examples of some of our guru dashboards which takes us to #7! If you’re wondering why this is so far down the list, it’s because we have yet to do an official launch, as we are still making some small adjustments. Expect to hear more about our official commercial website Benchmarkers Business Intelligence, where we work with some of the world’s biggest companies to deliver state of the art BusinessObjects deployments, migrations and implementation being sure to include our well known and best designed dashboards. We will do an official company launch in Feb 2011, but those who wish to find out more can visit our site http://benchmarkers.com to see how other companies are benefiting from our services. It is no secret that the acquisition of BOE by SAP took the BOE community by storm in 2008, me included. I was again taking by a storm when I was informed that I had been nominated by the SAP BOE community to become an SAP mentor. There isn’t enough space in this blog post to document my adventure in the first year as an SAP Mentor, but I will do a better job to document the journey in 2011. Making our Top 5 is SAPPHIRE, the biggest SAP sales event of the year. Unfortunately, it was not an option for many BOBJ folks who shied away from the heavy SAP ERP presence. 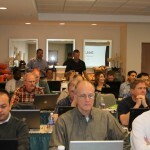 Teaming up with ASUG, SAP managed to pull together one of the best events that we ever attended. There was no shortage of BusinessObjects information, just BOE attendees! Coming in at #4 has to be the first official BusinessObjects virtual competition (at least that we know of). With a name like Reportapalooza how could we forget? We emailed asking for your votes and entries, you won prizes, saw some really cool dashboards and then forgot it existed. While the event may have lasted for a bit too long, we do give SAP an A+ for wanting to engage the community with their software. Recruiting big BOE community names like SAP Mentor Jamie Oswald, known author and blogger, Jim Brogden, and myself, it was the first of its kind. Big KUDOS to the winner, Brian Durning at PepsiCo (also ASUG Crystal Reports Chair). Will SAP do another one next year? Guess we’ll have to wait to see. Making the top 3 has to be the fact that our Twitter and Linkedin Group both exceeded 1,000+ followers this year. We are delighted by the tremendous growth and look forward to having you be a part of our community’s evolution in 2011. Lots of exciting changes in 2011. We truly feel that we host the most passionate community members in the SAP BusinessObjects realm and we appreciate all of you! As the only BusinessObjects conference that currently exists (though more are popping up in 2011) this event took off in Orlando with over 1600+ attendees, a far cry from its despicable attendance in Dallas the year before. On-site was the “Who is Who” in the BOE world, along with tons of informational sessions, and keynote demos of the upcoming BOE XI 4.0 release. Most shocking however was the formal announcement by Steve Lucas, SVP for SAP Business Objects North America that BOE had accounted for 52% of SAP sales up to Q3. We also co-hosted the wildly successful 2nd Annual Xcelsius Gurus Reception with the help and support of the SAP Xcelsius Marketing Team. Pics can be seen here. Topping the charts at #1 is of course the Xcelsius name change to SAP Crystal Dashboard Design or #SCDD depending on what day you look on twitter. While some who are in emotional distraught blogged and tweeted that the “Xcelsius name will never die” it is clear that SAP is moving forward with it in an effort to consolidate their Crystal product portfolio. If it is any consolation, SAP took it one step further to leave no rock unturned by also changing the names of long beloved products such as ‘Infoview’ to ‘BI Launchpad’ (1/10/11 Update. Correction – Web Intelligence will not be remained and hence the statement has been removed. Refer to the comments below). They even managed to gain accolade from Gartner who openly criticized SAP for their frequent name changes. ** Just for fun we had to add this video done by fellow SAPMentors, Jon ERP & Dennis Howlett on this phenomenon! Official launch of commercial website Benchmarkers Business Intelligence! Mico Yuk is a 2010 SAP Mentor and the founder of the Xcelsius Guru Network and the Everything Xcelsius blog. To learn more about her, please visit our About Us page.